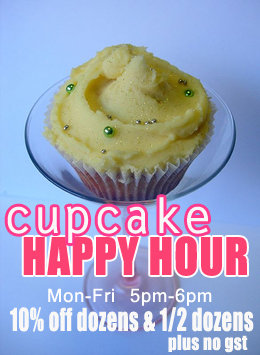 Of course it's a happy hour if cupcakes are involved! I've never tried their cupcakes but I think they look beautiful and I really like their logo and branding, from the name to the way they've set up their site. It's simple but easy to navigate, and they're on Facebook and Twitter. My only quibble is I had trouble signing up for their newsletter; I got an error message in Firefox and Safari. 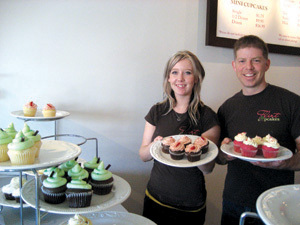 The pair initially considered the idea of adopting the Vancouver-based franchise Cupcakes, but realized it would mean ceding their conceptions and control over their business. "We both thought, 'If we're going to do this,'" tells Krupa, "'we're going to do this with our ideas. We have enough skill and life experience to come up with our own vision of what we want.'" Everything from the flooring to the colour scheme to the logo was discussed in detail. Then came the cupcakes themselves. "Michelle was pretty particular about what the recipes would taste like," says Krupa. "She's been making cupcakes for 10 years." The bakery offers either a vanilla or chocolate cake base with eight different icing varieties per day. 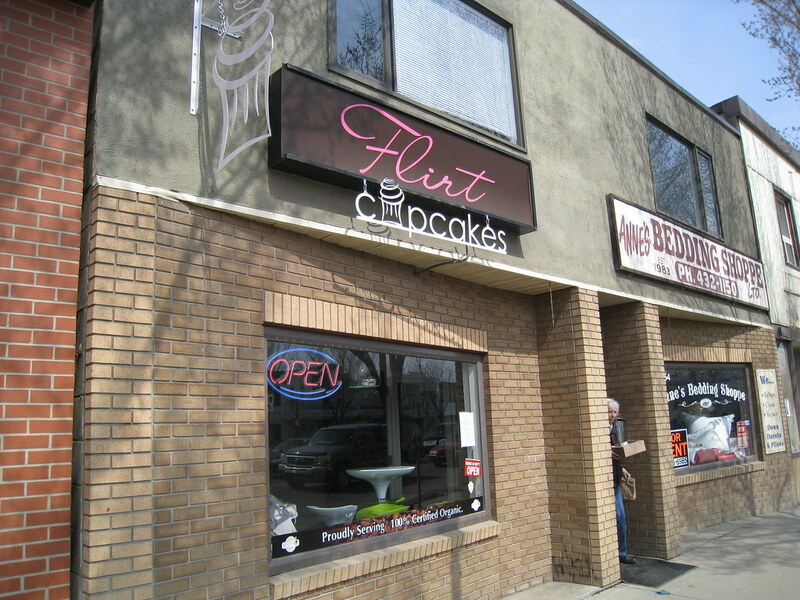 The icing recipes have slowly evolved as well, as Flirt recently began using a Madagascar bourbon vanilla for their buttercream icing, and after being introduced to a Venezuelan cocoa by Kerstin's Chocolates, integrated the richer, premium cocoa into their signature chocolate icing. New flavours are also continuously in development, with a goal of offering a special type every week (a black forest cupcake is already in the works). Regular patrons have already pegged their favourites, ranging from Krupa's preference, the Marie Antoinette with a cream cheese icing, to Lemoignan's pick, the strawberry-topped Wild on Whyte. 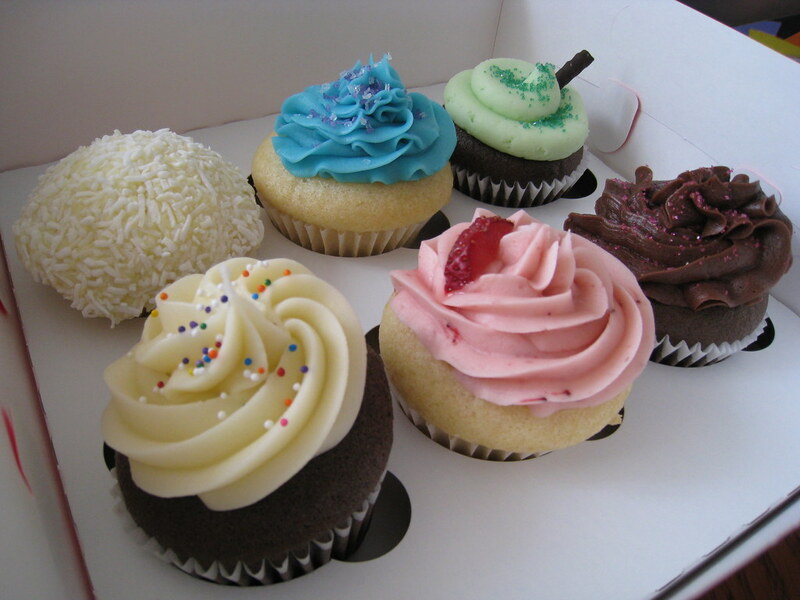 Krupa says the store has received their share of compliments for their cupcakes. "A little old lady came in one day," Krupa shares, "and she just said, 'I want you to know that your vanilla cake tastes like white toast with lots of butter and honey.'" Oh YUM! I've been on a serious and random cupcake kick lately. No idea why, don't care why :) lovely blog you have here.